A powerful rejuvenating night treatment capable of regulating the Skin-Age Biomarkers that prolongs the lifespan of skin cells and slows the aging process to preserve the youth of the skin through a natural magnetite exclusively designed to treat skin ages 35 and over. This recently discovered magnetic active ingredient, Bio-Magnet Nanosomes (Patent Pending), provides extremely effective rejuvenating action with "retinoid-like" effect* of cell renewal, improved skin tone, skin texture and luminosity without the common side effects of sun sensitivity, dryness and irritation or inflammation. 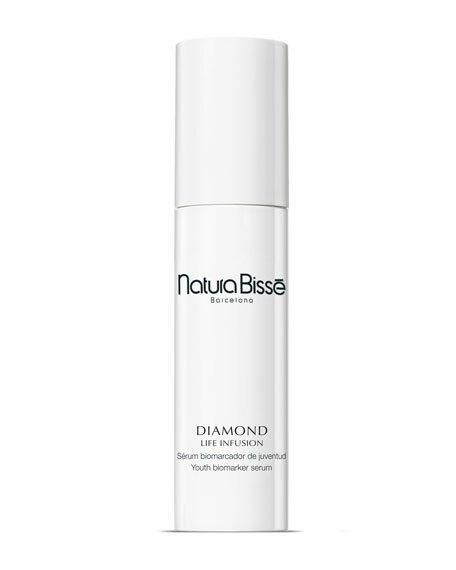 Diamond Life Infusion is an ampoule-strength renewal serum formulated with 16 potent anti-aging ingredients combined to enhance their synergy with the exclusive cutting-edge Diamond Delivery System that stimulates a greater and more even penetration of ingredients with diamond nanoparticles, providing long-lasting and cumulative rejuvenating results. This groundbreaking serum infuses the deepest levels of the skin with the highest concentration of active ingredients within the Diamond Collection for unprecedented lift and rejuvenation. Apply nightly on face, neck and décolleté area, massaging gently until completely absorbed. This ampoule-strength serum restores the skin nightly from external aggressors and damage. By applying nightly, it enhances the effect of the avant-garde elements included in the formula and increases the firming, regenerating and rejuvenating properties of the treatment. For in-store inquiries, use sku #253397.